Self-publication is the process of producing, marketing and delivering a book, or any written material by one’s self. This process is a bit different from traditional publication because the writer acts a publisher himself. Here, the author is also responsible for being a proofreader, investor, marketer, advertising agent, and distributor. It is really hard to approach a good publisher, convince them for investment and promotion of your book. Also, another fact is that many of the self-published books had received success and popularity. So, self-publication is also an option for writers. In this article, you will be reading about some worthy benefits of self-publication. Before pitching your book for publication you need to decide on the medium. Two of the ways are printed books or E-books. Though it’s an age of internet but still readers love to enjoy books in printed form. Many like to keep the collection of books in their study rooms or shelves. The fact is that printed publications have a much inclusive audience than E-publications. Physical book charm is still valuable to readers. But E-books require less investment. Some readers want free/ low-cost material or easy excess material and E-books are good options for all of them. An e-book may exist as nonentity more than a software file that can be sent to the customer via e-mail, or downloaded from a website. Even if you choose to deliver the book on a disk, your production expenses are still less than that of a printed book. Self-publication was having a drawback that what if the published number of copies of any book will not be sold?? But now it is no more a problem. The Print on Demand (POD) technology is that copies are not printed unless they are ordered. So the investment, however, remains safe. This has made self-publication more attractive for authors. As the command is in your own hands so digital, audio, e-book, printed copies or rights on TV any of the selling way can be adopted. Infect you can go for both self-publication and traditional publication at a single time. This phenomenon is called the hybrid author. You have to put your efforts in writing best material, visualizing the final design, publishing and marketing your book. These efforts are for more worthy than running after an agent or publisher. Basically being a self-publisher is also being an entrepreneur. This can teach you many great life lessons. The final product will not be inspired version of agents or publishers. It will going to be the real author`s effort and will be sounder in terms of originality of material. It is more work to do everything yourself as an indie author, but if you’re an entrepreneur at heart and can learn to be disciplined to wear all these hats, you’ll be a successful indie author. This is the most amazing merit and most likely aspect of self-publication procedure. You really don’t have to wait for 1 or 2 years to market your book. Printed books can fairly be delivered to market within six months including all the work. E-book publication is even faster than prints. The only a couple of weeks is required to complete the process of publication. Font style, spacing, cover page design, stylization, binding type etc. all can impress the reader a lot. The typical publishers usually do for mainstream or traditional draft of designing. In self- publication you can hire a designer to reflect best of your ideas through the cover page and modeling of the book. Many of the books involve pictures and graphical contents. Supporting your material through photography, graphs, illustrations and diagrams are impressive and it also increases the understanding level. Self-publication provides you a ground to strengthen the graphical context of the book. High-class photography and illustrations can make a book more catchy and wonderful. Comic and design books actually enjoy the best advantage of this sector of self-publication. Many authors complain that publishers don’t allow highlighting controversial points in the book as they don’t want to take any risk. They either edit all such material or ask the writer to change it. This is actually a compromise between publishers, writers, and readers. So there is no more need to sacrifice on the originality of thoughts and material. Self-publication only needs sensor approval in such cases and highly controversial topics can be delivered uncut through this mean. Jasmine Demeester works for an academic consultancy which is one of the most popular dissertation writing service in the UK. Moreover, she writes guest articles for many websites. 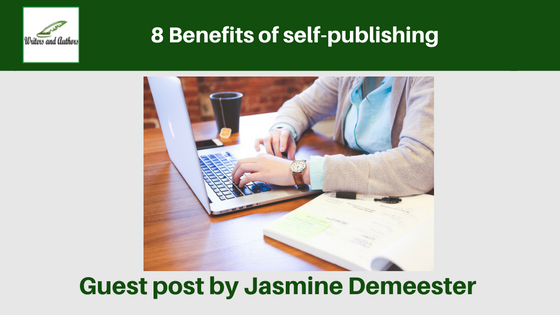 Your 8 benefits of self-publishing steps was very interesting. I know I find it easier to look on Facebook about publishers, you can find all kinds. It's good to learn about who would take care of your book and the cost up front and who you want to go with.